[AG] To my knowledge too! [AS] Do you plan to display them together in the office? [AG] Ah. Unfortunately, the IgNobel Prize … I have somewhere the IgNobel Prize in my office. But, it’s not really something, ok, visually attractive. OK, but speaking seriously, I’m actually quite proud of my IgNobel Prize – not because of IgNobel Prize – it’s a more subtle association. 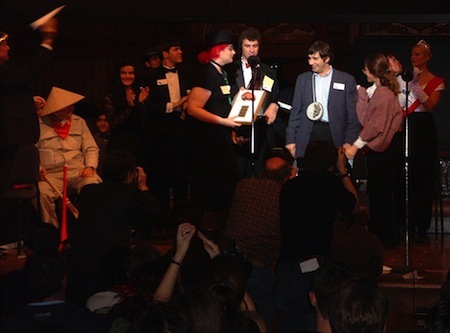 Essentially, yeah, IgNobel Prize is given for something which forces people to smile. And, that was always the idea behind the flying frog, which we shared with another distinguished scientist, Professor Sir Michael Berry, known for his ‘Berry phase’. And, the second thing which with Nobel Prize, it’s quite obvious that, if you are offered, I’m not aware about anyone who rejected an offer of Nobel Prize, ok. Although history might be long. [AS] Well, there’s Jean Paul Sartre but, otherwise, you’re pretty much right, yes. [AG] Yeah, ok, so, so … But, with IgNobel Prize they ask you a few weeks in advance whether you are ready to accept this prize or not. So we considered hard and, at the end, we had courage to accept this IgNobel Prize, yeah. So, I’m proud that I had enough courage to do that and I do not regret accepting it. [AS] It certainly doesn’t seem to have done you any harm. On the contrary, I suspect. [AG] Yeah, with the benefit of hindsight! Ha! BONUS: The photo below was taken at the 2000 Ig Nobel Prize ceremony. The central characters are Andre Geim and Ig Nobel minordomo Julia Lunetta. Posted by Marc Abrahams on Tuesday, October 5th, 2010 at 3:45 pm under Ig Nobel.